At Sterling Hall, we value innovative academic practices and boy-focused programming that inspire individual growth, curiosity and passion for learning. The following learning approaches have been introduced into the SHS curriculum following extensive research by our faculty. Singapore Math is a teaching method based on Singapore’s national math curriculum. It is designed to connect math learning to a great variety of learners and its framework focuses on an in-depth understanding of essential math skills with a special emphasis on problem solving. The program emphasizes mastery of foundational skills on the well-tested assumption that higher levels of math learning require a students’ deeper understanding of math as a basis of success. Singapore’s three step learning model of concrete, followed by visual representation, followed by the more abstract (questioning and solving written equations) has become a finely tuned method for math learning in many educational jurisdictions worldwide. Singapore Math has been successfully implemented in the Primary Division in Grades 1 and 2 and will soon be introduced throughout the Primary and Junior Divisions. Guided Reading has become a proven method of helping boys use and develop strategies to read with greater independence and fluency. Each boy in Grades 1 – 3 receives direct support from a reading teacher as he reads and processes texts at increasingly challenging levels of difficulty. Reading teachers work with small groups of boys ( 6 or 8 boys) reading at a similar ability. Guided reading tends to deliver greater enjoyment of reading over the long term, because it helps boys to construct meaning from what they read and to master an understanding of increasingly complex words and grammatical structures. Interaction with their teacher and reading peers keeps boys' confidence with reading intact and evolving as they learn. In the 2013 – 2014 academic year, our Grade 4 classes are piloting a new approach to the teaching and leaning of written composition. The 6+1 Trait Program is a world-renowned framework for guiding the instruction of writing. It is built around an educator-identified and researched common understanding of what good writing looks like; namely that there is a clarity of ideas, good organization, clear voice, effective word choice, fluent sentences, effective use of grammatical conventions and clear and effective presentation. The program gives teachers and students a common and easily-understood vocabulary for the teaching and assessment of writing in all disciplines. The approach answers the question of what is essential for good written composition, for all audiences and purposes. It is a tested foundational tool that sets up a boy's life-long approach to good writing, a skill that is essential to success at all levels of education and beyond. Public speaking has been a longstanding educational emphasis at Sterling Hall. Boys in all grades have opportunities to speak at the podium during weekly assemblies in front of their peers, faculty, staff and parents. This might include making announcements, sharing sports, club or learning successes and celebrating school spirit. These weekly speaking opportunities complement an annual public speaking unit, taught in all langauge classes from Grades 4 – 8 in January / February of each school year. Boys compose, edit, practice and deliver two-to-five minute speeches on a topic of their choice. In Grades 7 and 8, boys attempt the categories of either humourus oratory or persuasive speaking. Within the unit exists the option for successful speakers to further develop their skills in the company of larger audiences. As with all of our programmatic approaches, the guiding principle is the development of life-long skills essential to the success of further learning. Speaking publically, entertaining or convincing others are essential skills for this generation. Many of Sterling Hall’s best educational practices are prompted by the best educational research. In the past five years, multiple studies have examined the degree to which students retain what is taught in school. Studies repeatedly show that when subjects are taught in isolation from each other, students are denied an opportunity to connect with knowledge from a variety of angles and their experience with any one subject is limited, as is their retention. Schools have responded by making curriculum more transparent between disciplines and have looked for opportunities to merge curriculum where possible. In Ontario’s K-8 curriculum, the most successful of such ‘curricular mergers’ is between Social Science and English, as is the case for our Grades 6 and 7 program, and Science and Social Science in our Grade 8 program. In these subjects, a boy's examination of fictional works may find the subject matter set in the same period being studied in History. Similarly, a mapping unit in Physical Geography may connect directly with an examination of the planet’s hydrosphere in an Earth Science unit. This interconnected approach to learning mimics how the learner’s brain itself is constructed; where knowledge is only retained through multiple connections in a web-like formation. In Grades 6-8, elective courses are introduced to the curriculum, allowing each boy to choose an additional subject that reflects his areas of interest, strength, and passion. This enables the boys to expand their academic interests and explore areas not commonly taught at the elementary level. Boys work in small classes. Each class combines students from multiple grades, encouraging older boys to take leadership by helping younger ones. Elective subjects offered vary from year to year. 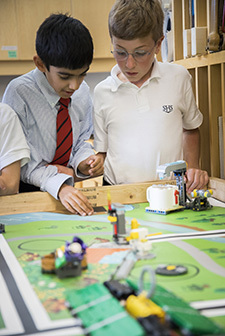 Popular electives in recent years have included Woodworking, Lego Robotics, Journalism, Mathemagician Studies, Music and Technology, Film Studies, Yearbook Design, Novel Writing, World Tour, Photography, High Level Sports Performance, Virtual Reality Programming, Business and Finance, Spanish, Drama and Animated Movie Making. Unique to our school, our Visiting Artists Program offers Sterling Hall boys the opportunity to meet, observe and interact with a professional Canadian artist. This interpersonal connection adds life to our curriculum and lets our students observe artistic excellence and achievement first-hand.